On the 4th of January, 2015, our team from Kalki Avatar Foundation Sri Lanka organised a healing camp at the Vishnu temple in Dehiwala, Colombo. More than 500 people who attended the camp were pleased to hear the universal message of love. 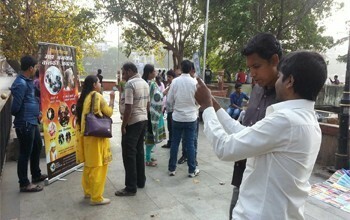 Many wanted to learn more about the teachings of Kalki Avatar Ra Gohar Shahi. Simran of 'Ra Raam' was granted to aspirants and towards the end of the camp, delegates distributed many leaflets to passers-by at the temple.